What does a walrus use its tusks for? A walrus is a large seallike animal that lives in the cold North, near the edge of the polar ice. stop growing. The tusks are really two overgrown teeth that curve downward from the mustached upper tip. Some walruses have tusks three feet long. 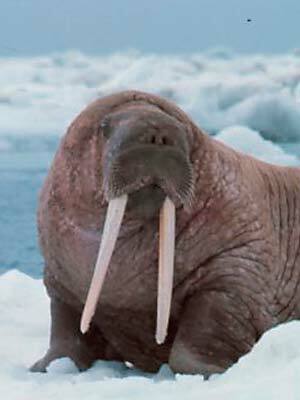 Walruses feed on clams and other shellfish which they rake from the sandy ocean floor with their long tusks. They crack the shells with their strong back teeth. The tusks also make good weapons against polar bears enemies of the walrus, or as grappling hooks to help the bulky walrus pull itself over the slippery ice. Walruses prefer to spend much of their time sunning themselves while drifting about on pack ice. The osprey is a large bird of prey that resembles the eagle. A full-grown osprey may be 2 feet long with a wing-spread of nearly 6 feet. It is dark brown above, white below, with enough white on its head to be easily mistaken for the bald eagle. Osprey are found near rivers, lakes and sea-coasts all over the world. 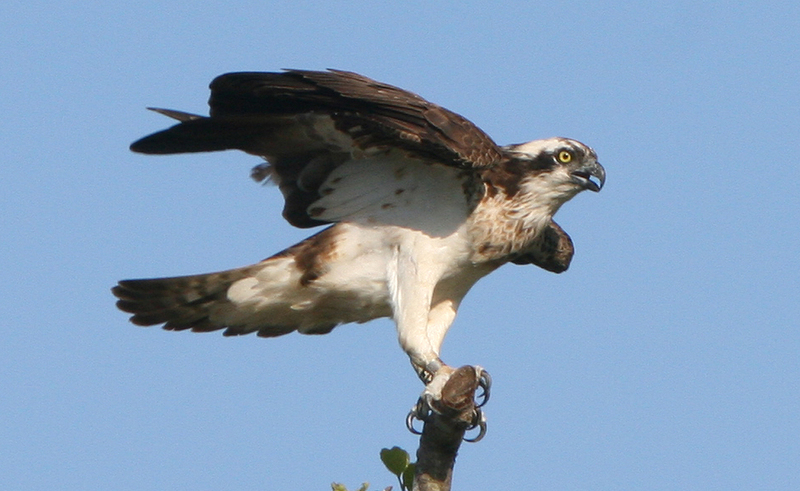 A common name for the osprey is “fish hawk” because it feeds almost entirely on fish. It fishes by flying over the water. When it spots a fish swimming near the surface it dives feet-first, hits water with a great splash and seize the fish with its long, sharp talons. Sea eagles often rob the osprey of its catch. The eagle is not a very good fisherman. When it spies an osprey with a fish, it swoops down and forces the osprey higher and higher until the osprey tires and drops the fish. Why are pigs so greedy? You may heard the expression “eat like a pig” to describe someone who overeats. Pits have the reputation of being very dirty and greedy animals. It is true that pigs are not fussy about how they eat. But they are not greedy. 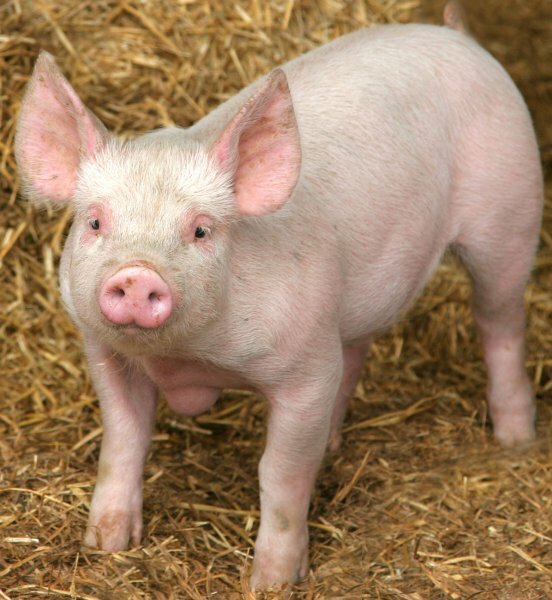 Pigs eat the kind of food that makes them fat, but they seldom eat more than they need at the time.—as some humans do. People who see pigs wallowing in the mud often consider them dirty and stupid. A farmer knows better. The pig’s thick skin has no sweat glands to serve as a cooling system. Pigs wallow in the mud only because it helps them keep cool, and to protect themselves from insects. Pigs are not naturally dirty creatures and will keep themselves as clean as most other farm animals. The przewalski’s, or Przhevalski’s horse, is the last remaining species of true wild horses living today. (The so-called “wild” American mustang is descended from domestic horses that later escaped, so it is not a true wild horse). A Przewalski’s horse can be easily identified by its stocky body, short legs, rusty red coat and bushy mane that usually stands upright, instead of falling over the way manes do on domestic horses. It has a dark “donkey” stripe along its back. 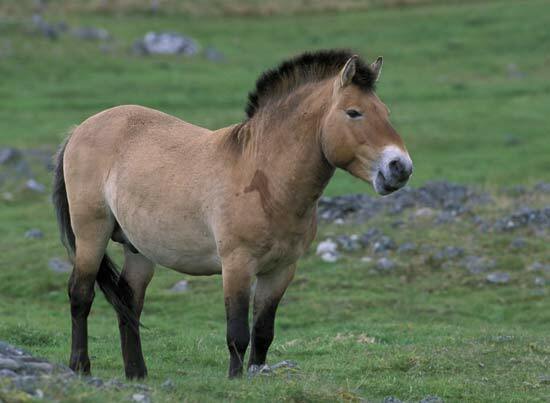 Today Przewalski’s horses survive only in small numbers in Central Asia and in some zoos. This rare, pony-size horse is similar to horses that cavemen painted on the walls of their caves thousands of years ago. They hunted the ancestors of this ancient horse just as they hunted mammoths, for food. An ermine is really a short-tailed weasel. 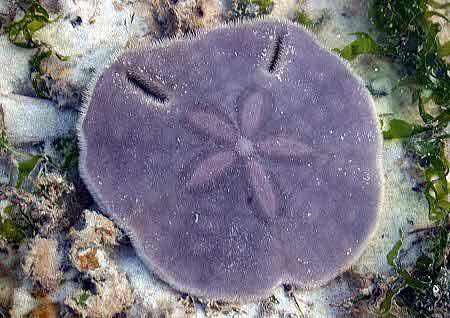 In summer, its coat is brown in color. 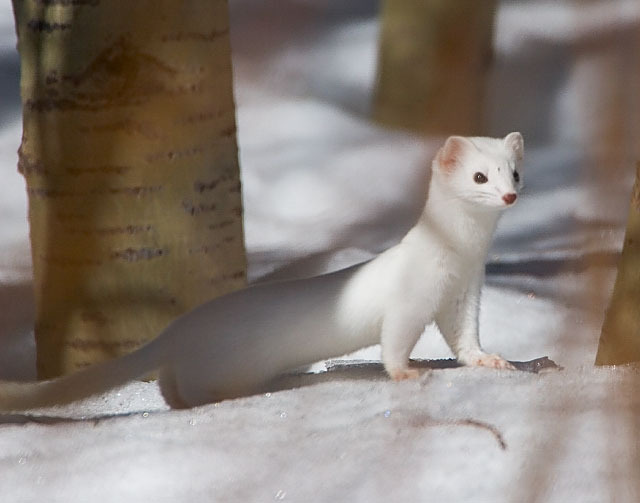 In winter, the ermine is entirely white, except for the tip of its tail, which is black. The animal is called an “ermine” only when its fur is white. When its coat is brown, it is called a “stoat,” or short-tailed weasel. The ermine has a long, slim body. A full-grown ermine may be only 1 foot long. Scientist are not really sure what makes the ermine’s fur turn white in winter and dark in summer. Its color helps it to hide from enemies. The white fur is almost invisible against the snow in the cold country where it lives. At one time in England, ermine was considered “royal” fur. Only the king and queen and other members of the royal family were allowed to wear this valuable fur. 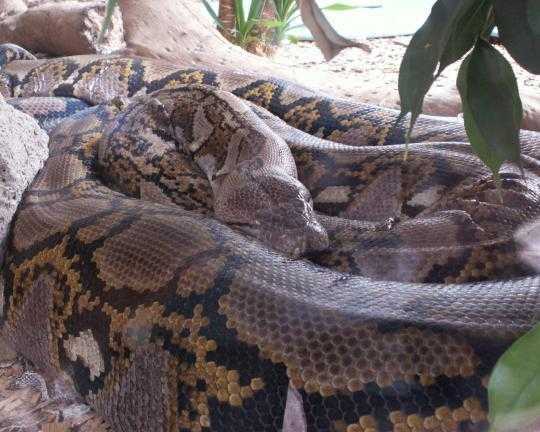 Perhaps the largest in the world is the giant anaconda, which lives in tropical South America. It may grow to be nearly 30 feet long and weigh over 250 pounds. This giant snake, also called a “water boa,” lives in swamps and rivers. It has olive-green skin, often with many black rings or spots. The anaconda is not poisonous. It kills small animals for food by constriction. That is, it squeezes its prey to death by winding its powerful coils tightly around the victim. It does not have to squeeze hard enough to break the victim’s bones, it squeezes just enough to stop the victim’s breathing. The anaconda then swallows its prey whole, without chewing. It can swallow animals much larger than its head because its jaw is hinged so it can be stretched far apart.